US Soccer Director of Talent Identification explains why DA players can not play for their high schools. 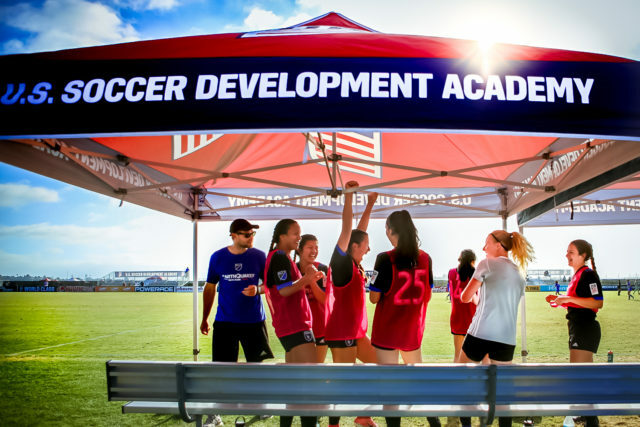 The Boys’ Development Academy started in 2007, and the Girls’ Development Academy started in 2017. Since then, many families strongly disagree with US Soccer’s directive that DA players are not permitted to play for their high school teams while they are on a DA roster. Mirelle van Rijbroek is the Director of Talent Identification for US Soccer. I asked her to explain US Soccer’s decision to not allow DA players to play for their high school teams. High school sports are a treasured rite of passage for teenagers and their parents. 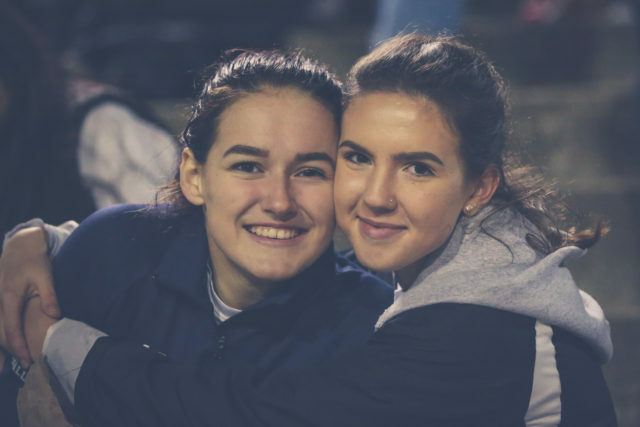 Many highly experienced club coaches confidently explain the benefits of high school soccer: Learning from different coaches, leadership opportunities, playing with and against opponents who are years older and stronger. However, the Development Academy is not changing their policy. Van Rijbroek’s Harvard metaphor clearly exposes US Soccer’s view that the Development Academy is not an extra-curricular activity or a league. Should a player choose a club team that allows him/her to play high school soccer? Should he/she join a DA team? Families in the DA program understand that they are choosing to be part of a high-level, highly competitive developmental system that doesn’t include playing for their high school. As is the case with all important decisions, there is no standard answer, and each family must decide their own individual path through the high school years. How many players made into higher levels teams less than 1%that were in the academy the Las 3 years. Cuz academies don’t develop a anybody. Just recruit new players and get rid of the others. The Development Academy is not an extra-curricular activity. Exactly! Couldn’t be happier that my daughter is training at the level she is. Harvard would be ok with that, and it’s done all the time. People go on Study abroad, they go on Fulbrights. Etc. Dan that is the exact point I would have made the opening analogy is 100 % terrible. There are many colleges that actually encourage all students to go elsewhere to expand learning and to add a different point of view. Some schools actually force you to take “Field Periods” or whatever they choose to call them to graduate. That doesn’t just mean a work internship it means other experiences that are valuable. I went to a Jesuit school where all education is based on being well rounded- all students must take a broad base of courses many not directly related to your course of study to expand ones knowledge and teach you to look at other ways. Its made me a better educator and a much better person having learned about many things I might have missed. EXACTLY, I thought the same reading that. Our highest quality education ENCOURAGES well rounded experiences. I think it’s telling that the USMNT doesn’t seem to be improving post-DA and concerned that the DA just started for the women. In the US, elite athletes have a number of sports to choose and this philosophy is not going to get us the best and brightest, well-rounded athletes in the country. That would be great if every DA program was equal. Our daughter almost left the game after playing in the inaugural season of the Girl’s DA. All the promises that went unmet. Our club just entered the DA. Those are some of the fears we have. All the promises sound great but will they be met? It’s a hard decision for these girls. Wish I had a crystal ball. We are in the midst of the same experience – daughter is now considering quitting the sport. My daughter still loves soccer but has HATED the transition from ECNL to DA. Much of it has to do with the new club executives and the unilateral decisions made without thought of consequences and the resultant unnecessary stress on young ladies. EXAMPLE; Moved practice location an additional 20 minutes away. Stripped all uniform numbers from girls and reallocated – younger girls received typical soccer numbers where older girls who wore the same number for many years are now wearing football numbers. So much for recruiting continuity. It seems like US soccer is ONLY looking at this through the lens of developing players for the national team and the rest of the girls are disposable. They prescribe a standard, UNPROVEN formula to all clubs and our daughters are essentially lab rats. They fail to recognize that the additional time commitment to practice reduces the STUDENT’s time to study – which for an honor student is an extreme stressor. Let’s be honest – most of us are looking for our girls to experience structured, balanced, healthy physical and mental activity that helps them prepare for the future. This especially applies to the goal of reaching a primary objective – education. We are looking for long term balance not for Navy Seal training environment w/ high level drop out. Our daughter went from being a highly recruited sophomore in HS, practicing 3 days per week, captain of her team(s) while maintaining a 4.3 GPA to one that now is required to participate in 4 practices and usually one other non game activity per week. Her one way drive time is at least 40 minutes to practice – one way in rush hour that is longer. This forces her start her homework usually after 9pm and most often in bed well after midnight. Obviously US soccer. has applied theory and hypothesis in the expedited roll out of girls DA in order to take share from the already proven and successful ECNL. Can you say short term oriented, self serving, ego driven program – that is micro focused on a 20 person team vs building the country wide foundation love of the game?! The largest problem is cost and some markets tauting a professional system that barely makes the cut on some premier teams. Main example is Empire United in Rochester NY. No matter what they say or do they see the game and players as a zero sum game and talent as set in stone. Sure winning isn’t everything but winning 1 out of every 5 games would be better than what they have accomplished with the girls side. 5500 dollars and I can find better coaches easily. Sad and even sadder for the parents that are bamboozled into thinking they are it. The culture is terrible. Everyone is out to get everyone else on the team. So cliquey. When they play it’s like 2-3 teams against the 1 opponent which is why they lose so much. Looks like someone isn’t paying attention. considered outlawed underneath the Structure. The problem with that analogy of Harvard and DA is flawed in many ways. First and foremost Harvard is an established institution with history and DA is not. Secondly some of DA club teams in boys side are not that competitive, not even close to a strong or decent F1 level teams. I have seen small clubs in Los Angeles area that constantly demolish some smaller DA club teams on constant basis and on every tournaments. And it does not help that DA is approving clubs for DA badge that are sub par to some established clubs such as LA Galaxy, Pateadores, or Strikers. US Soccer can’t have pathway for success by limiting the pool of the players on constant basis. What a horrible explanation. Clearly, he didn’t go to Harvard, lol. Perhaps the explanation could’ve been that the development academy has highly skilled licensed coaches as opposed to most high schools that have high school teachers or former high school players wanting to coach their kids or to earn a little extra money.. I believe the better coaches ARE in the clubs and not in the schools. 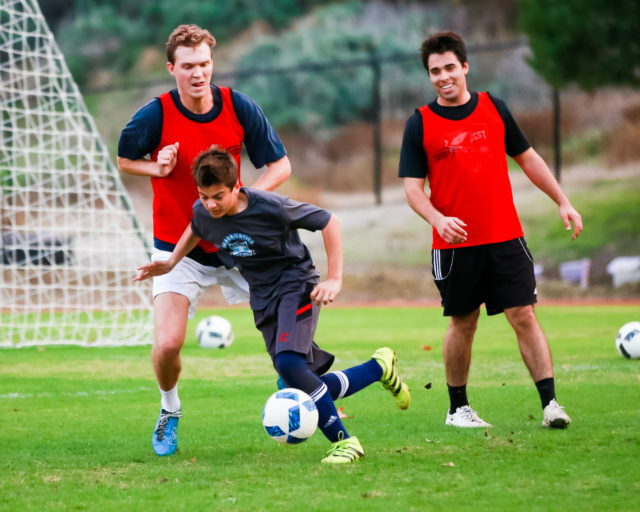 Players are more skilled, faster, higher soccer IQ in the academy’s. The level of play demands quicker thinking. Watching high school soccer a lot of the times is like watching recreation soccer. A few good players that attempt to dribble through everything; thus, changing their style of play once they finish fall soccer and get back to the club. In other words, they may have regressed. It is a choice. It’s a family decision. If your young player truly has the potential to move on to college of pro then it would be my suggestion to stick with the development academy. Curious what the value of the da approach really is? Just watched England v US. Figure a decade plus in, we’d start to see better soccer being played by the US. Entirely too much focus on speed and athleticism. Small improvement in technical skill. Lacking tactical awareness and execution. Meanwhile da academy demands 100% commitment. What’s their deliverable for this sacrifice and 5-10k? Perhaps a pathway to sub par level US college play? It’s really hard to understand how 5000+ players committing to da academy approach for 10+ years can produce 15-20 talented international players. Unless the approach is flawed? So True team. Most DA clubs in USA don’t put soccer players together; it is like that USA coaches are interested in track and field team. Players can easily do both DA and HS. 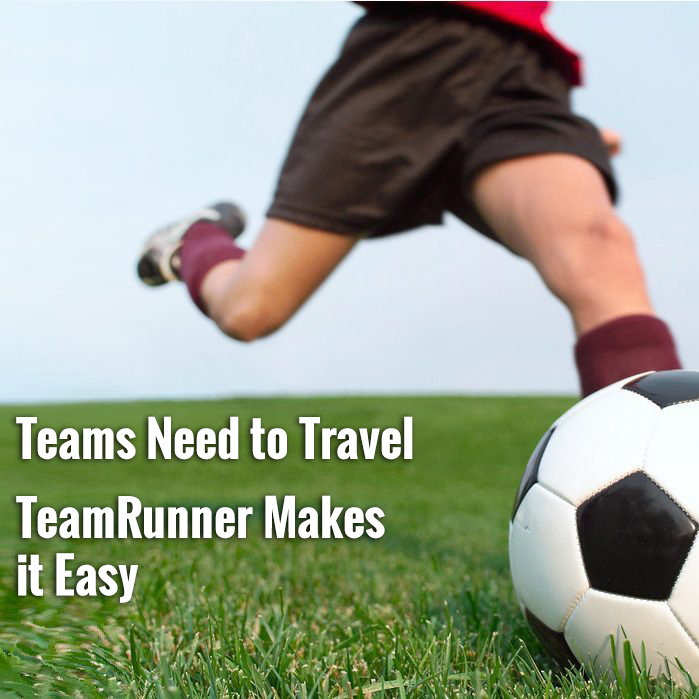 Our HS teams work hand and hand each year with the top clubs to plan their schedules and away trips. Many times, the HS coaching staff is also the club coach and at the very least both sides know each other very well and constantly work together for the benefit of the player. PS. that was a very weak answer. You can attend Harvard and also be on a bowling team, or take an online course, or be involved in a play, or play intramurals, or etc, etc. You don’t have to leave DA to play HS, you can do both, just like you can with ECNL. It is just a business decision/model (and a mistake IMHO). US Soccer/USSF could not care LESS about the kids and parents. Until we, the money holders, develop our own leagues or put our feet down together, these *** at USSF and DA system will continue with their antics. This article has a lot of flaws with the College analogy. Yes, you as the player and parents make the choice to attend that college for a reason – but guess you pick your class or…you can change your major – let alone travel abroad to learn. As someone who is new to the soccer world with a son approaching the time to make decisions about DA or something else. I keep reading about the program and some of the common themes I read in articles and comments is there is no reference to team build. It’s all about the individual and learning skills. Learn skills is great but team building a major skill and I think the apparent lack of that idea in the DA is why the US Men’s team is very lacking. As one commenter mentioned, a decade into the DA program you would think we would see signs of something happening in/on the Men’s team but if anything – it seems to be on a downturn. Yes there are some talented players for sure – but I thought the DA was the best of the best? If that is the case – then I have serious doubts about the overall program and it’s goals. Which begs the question as an outsider looking in – what is the actual end game for DA? Is it to produce world-class athletes? To groom a potentially formidable national team? I guess in the next year or so I will learn more to make the best choice for my son – but the current results of the DA program have left very underwhelmed about spending a lot of money, time for him and a family that in the end – he could have a very fulfilling experience and a chance to be on something potential more memorable. DA is just another failed system from USSF/US Soccer. Many excellent players never play DA. @ Barry Politi: I share the same EXACT Sentiment. I have been accompanying with interest the comments, because I have a Brazilian son who chose to study in an Academy in the US and to play soccer by that Academy. And we see that the DA system, based on pay-to-play, leaves many good athletes out, rather than being structured in investing in good players. Anyone who can afford to pay 5k-10k will not always be a good player. On the other hand, very real good players can not afford 5k-10k. Looking at where the good players come from in Brazil, Argentina and France (where we know them), the teams invest in the formation of good base teams. They recruit athletes based on their abilities, rather than for the possibility of payment. Not that there is no investment, money at stake. There is much more. There are big companies that sponsor the training of these athletes and then reap the high fruits of these investments. In this way, there is great competition for recruitment and it results in a natural “filter”: only the good ones are recruited. And the Clubs (PSG, PALERMO, SAO PAULO, RIVER PLATE, ETC) invest in these young athletes and they will certainly be the big and expensive players in the future. Development Academy (pay-to-play model) kills the community-based soccer culture that is unique in high school soccer (free-to-play model) . Why is the US Women’s soccer much more successful than US Men’s soccer outside DA program? It would be interesting to see how DA would change the successful landscape of US Women’s Soccer as clubs move into the Girl’s DA Business Inc. Very thought-provoking! I am working on an article about pay-to-play right now, in fact. The rest of the world, as they put more money into their women’s programs, is catching up to the USWNT! It will be very interesting to see how the Girls’ DA takes on the challenge! The Harvard analogy is horrible. I don’t know of a single institution which does not expect one to challenge themselves outside of the walls of that particular institution. There are countless teachers, coaches and mentors outside of the DA program who are excellent at what they do and who have a lot to teach our kids. For the US soccer to think they cornered the market on the right coaching talent is immature and short sighted to say the least. Keep on being elitist and you will never reach the world stage.